It is being released this Friday at the Bytowne Theatre. The day after the awards, Ottawa Life had an opportunity to speak with Mr. Hawco about topics ranging from this wonderful film, Canadian film distribution and what not to say in Newfoundland. Ottawa Life: Congratulations on the success of this movie, two awards last night at the Canadian Screen Awards that had to feel pretty good? Allan Hawco: I’m so proud to be a part of it. Frontier (TV show that he stars in and produces) was up for awards as well but because of the windstorm in Newfoundland I was stranded and missed the whole thing. Well we want you to be safe. 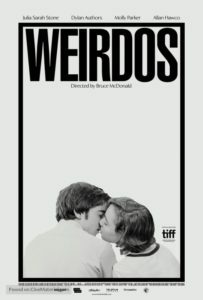 When we take a look at ‘Weirdos’ other than the opportunity of getting to work with your friend Daniel MacIvor what was it that attracted you to this project? That was a big part of it, the other part was his script. I think he is such a wonderful warm writer and his ability to dig into the complexity of who people are, what relationships are and what seemingly trivial simplistic dynamics that we live with daily. He has a great way of breaking them up and forcing us to look at them in a different way. On top of that Bruce McDonald is a national institution and I’ve never worked with him and I’m a huge fan. All of that together and the concept of having a few scenes with Molly Parker and I was available and they wanted me. MacIvor texted me when he was writing it and said ‘Bruce and I want you to be in this movie ok?’ and that was it. When you’re working with someone that you’ve known for years and years like Daniel, do you even consider it work? Well, yes unfortunately, I know what you mean. I spent a great deal of time breaking down what needed to be done for me as a performer. I took a really different kind of approach because I had been playing one character, the role of Jake in Republic of Doyle, for so long that I had a reach challenge ahead of me. I saw this as an opportunity as this character had interesting traits that it gave me an opportunity to start over. It would be easy to fall into that ‘warm blanket’ and relax and go with the flow but I felt more needed to be done. I thought your performance was very strong, specifically towards the end in those touching father/son moments with your character and of course the character of Kit in dealing with his sexuality. I’ll say something to you and please take it as the utmost compliment, after seeing this movie I likened it in my mind in some aspects to the Canadian version of ‘Moonlight’ and that was one of my favourite movies last year so that is nothing but a compliment to this wonderful film. They say in life timing is everything. Is it a little odd promoting a movie that is coming out after awards season because usually there is a lot of promotion leading into awards season and the awards were last night and the movie is getting ready for a theatrical release and a release on iTunes. Can you tell me a little about that? We have to do everything we can to get the message out to pass the material onto the people we need to watch it. We don’t have three hundred million or so people as an audience base we have thirty million people over a land mass that is truly awesome. One third of that population speaks a different language and we are just trying to get our material out there. The great thing about the awards is it’s a great way to promote the movie. I love that you saw the movie, maybe you or someone in your position wouldn’t have had the opportunity to see the movie if it wasn’t up for those awards. And the fact that Daniel won and Molly won gives us a little more to talk about and to try and get it out there. One of the most important things about these awards is the support for the industry as a whole because without getting the word out how are people going to know about these movies. I think the challenges isn’t that it’s a Canadian movie but with distribution as a whole. Is there a comment about film distribution? I know a little about it but I’m no means the expert. It’s tricky. It goes to how many screens are there? What’s our market share? What can the distributors afford to do? What can the movie theatres afford to do? There is no mandated quotas and there is no appetite for that. With independent features there are so many challenges and unless you have a cape movie or some kind of superhero movie it’s tough drawing people at the box office. I imagine it’s difficult for film distribution to sell and independent Canadian feature I’m happy when they do it. eOne pictures is there and so is Elevation Pictures. Elevation we did ‘Hyena Road’ together and they were committed full on and Cineplex was committed full on to get that movie out there because they believe in Canada and they believe in the Canadian story. I know there is an appetite for it it’s just how do we get their attention and keep pushing that. We have a few things in the works with ‘Take the Shot Productions’ (his production company). We are working to get more seasons of ‘Frontiers’ going, our fingers are always crossed in that regard. We’ve got a show in development with CBC called ‘Caught’ based on Lucy Moore’s novel that I’ve been adapting for a very long time. One of the things I love to do in my interviews is to play a game of ‘Rapid Fire Questions’. These are meant to be fun questions. Last night when you were watching the awards and ‘It’s Only the End of the World’ won (Best Picture) were you hoping there was going to be a ‘Warren Beatty’ type situation and they were going to turn it around and award it to ‘Weridos’? (Laughs) I was on a plane so I was only following by Twitter. Are you at the point in your career where you can go to Legends (a popular pub in Newfoundland) and get free Nachos? (Laughs) No. I’ve been banned from Legends. (Laughs) Ok, I won’t ask about that. How often do people tell you that you remind them of Colin Farrel? (Laughs) No, people tell me I remind them of what would happen to Colin Farrel if he had been injured horribly or disfigured and not given the proper genes. What is your favourite ‘Newfie’ saying? Newfoundland. When people say ‘Newfie’ it causes a whole…I don’t care….but don’t go to Newfoundland and say it as someone will take you hostage and make you listen to why they don’t like it. That’s a good one but there is a whole controversy around that. ‘Stay where you at til I comes where you to’ or ‘Stay where you to, til I comes where you at’. I’m more of a ‘Stay where you’s at, til I come where you to’. But people I respect are telling me I’m wrong. Well I respect you so I’ll go with that. Is there a movie you love watching over and over again? Yeah the old classic ‘Good Fellas’ it’s impossible to not watch it when it is on. My last question is we are of course celebrating the 150th anniversary of our beloved country. Next time you come to Ottawa will you give me the honour of allowing me to buy you a pint? Geez, I’d do anything for a free pint! I’d be honoured.